Lee Jae-gap, the newly appointed Minister of Employment and Labor, is taking on the new role as things are especially getting rough in the South Korean labor market. The country’s unemployment rate reached its highest level since 1999 last month, while the government allowance for jobless hit a record high. Prior to Lee’s appointment last month, the Moon Jae-in administration had been criticized by some for its purportedly pro-labor policies, including the latest minimum wage hike and reduction of maximum weekly work hours, which critics believe to be great contributors to the ongoing employment crisis. Lee was President Moon’s pick to tackle the challenges, replacing former Minister of Employment and Labor Kim Young-joo who openly prioritized tackling labor issues -- rather than those on employment -- throughout her term. Meeting with reporters Monday, Lee said he has been asked by Moon to do two things at once: create more jobs by supporting the nation’s private firms and guarantee workers’ rights at the same time. Former Minister Kim, on the other hand, had stressed that the Korean government always had neglected issues of labor rights, such as with low minimum wages and notoriously long working hours. One of few women serving in the Cabinet, Kim had been a fierce labor union activist who fought to end discrimination against female employees at banks, among other issues. Unlike Kim, Lee is a longtime civil servant who served at the Ministry of Employment and Labor for more than 30 years. 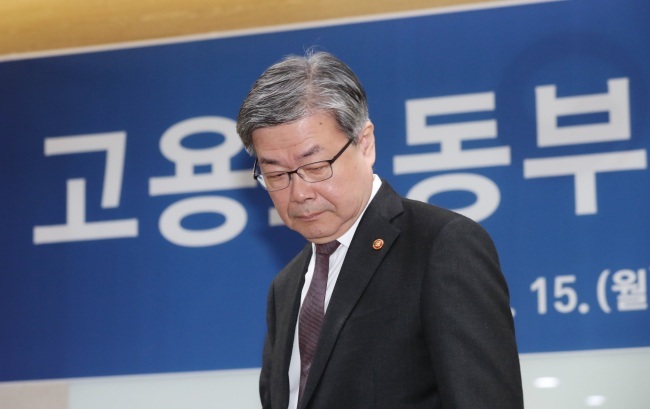 He also worked as vice minister there as well as head of the state-run Korea Workers’ Compensation and Welfare Services before taking on the role. When asked about his thoughts on the recent minimum wage hike, which has been singled out as a main reason behind record-high unemployment, Lee said that was not entirely responsible for the ongoing crisis. Meanwhile, South Korea is set to ratify four key International Labor Organization conventions on freedom of association and prohibiting forced labor.